베르너 아르버(Werner Arber, 1929년 6월 3일 ~ )는 스위스의 미생물학자, 유전학자이다. 스위스 아르가우주 출신으로 1978년에 제한 효소의 발견과 분자유전학에 이를 응용한 공로를 인정받아 다니엘 네이선스, 해밀턴 O. 스미스와 함께 노벨 생리학·의학상을 수상했다. Konforti, B (Feb 2000). “History. The servant with the scissors”. 《Nature Structural Biology》 7 (2): 99–100. ISSN 1072-8368. PMID 10655607. doi:10.1038/72469. Raju, Tn (Oct 1999). “The Nobel chronicles. 1978: Werner Arber (b 1929); Hamilton O Smith (b 1931); Daniel Nathans (b 1928)”. 《Lancet》 354 (9189): 1567. ISSN 0140-6736. PMID 10551539. doi:10.1016/S0140-6736(05)76606-X. Shampo, Ma; Kyle, Ra (Oct 1995). 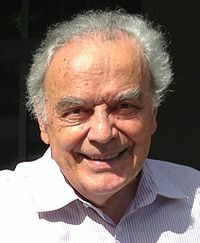 “Werner Arber--Nobel laureate”. 《Mayo Clinic proceedings. Mayo Clinic》 70 (10): 945. ISSN 0025-6196. PMID 7564545. doi:10.4065/70.10.sv. Kroon, Am (Feb 1979). “The Nobel Prize for Medicine and Physiology in 1978 (Werner Arber, Daniel Nathans, Hamilton Smith)”. 《Nederlands tijdschrift voor geneeskunde》 123 (5): 153–6. ISSN 0028-2162. PMID 368662. Piekarowicz, A (1979). “Werner Arber, Daniel Nathans and Hamilton Smith. Nobel prizes for the studies on DNA restriction enzymes”. 《Postepy biochemii》 25 (2): 251–3. ISSN 0032-5422. PMID 388391. Berg, K (Dec 1978). “The Nobel prize in physiology and medicine 1978. Nobel prize to a controversial research field”. 《Tidsskrift for den Norske laegeforening : tidsskrift for praktisk medicin, ny raekke》 98 (34–36): 1741–2. ISSN 0029-2001. PMID 725894. Desiderio, S; Boyer, S (Nov 1978). “Arber, Smith and Nathans: Nobel Laureates in medicine and physiology, 1978”. 《The Johns Hopkins medical journal》 143 (5): ix–x. ISSN 0021-7263. PMID 364154. “The Nobel prizewinners 1978: medicine. From modest beginnings...”. 《Nature》 275 (5682): 689–90. Oct 1978. ISSN 0028-0836. PMID 360075. doi:10.1038/275684a0. Peterson, Lr; Gerding, Dn (Aug 1978). “Protein binding and antibiotic concentrations”. 《Lancet》 2 (8085): 376. ISSN 0140-6736. PMID 79742. doi:10.1016/S0140-6736(78)92977-X. Petterson, R (1978). “Nobel prize laureates in physiology and medicine”. 《Duodecim; laaketieteellinen aikakauskirja》 94 (23): 1466–9. ISSN 0012-7183. PMID 729493. ↑ “Werner Arber - Autobiography”. Nobelprize.org. 1929년 6월 3일. 2012년 9월 9일에 확인함. 위키미디어 공용에 베르너 아르버 관련 미디어 분류가 있습니다.